Visual resolution technology has been evolving for years, beginning with Standard Definition (SD), then High Definition (HD), and even Full High Definition (Full HD). Each improvement in resolution is the result of gradual addition of pixels to sharpen an image. Now, fast forward to 2016, where the latest technology is 4K. Officially known as Ultra High Definition (UHD), 4K offers more pixels than regular HDTV. The ultimate result of this increased pixel breakdown is an image clarity that goes well beyond conventional 1080 pixel HD resolution and presents more vibrant, varied and realistic colors as well as much higher frame rates. There are Two Types: Cinema 4K and Ultra High Definition (UHD) – These terms are used interchangeably when referring to video products that are 3840 pixels wide by 2160 pixels in height, but there are some differences. Technically, 4K is “cinema standard” and has a few more pixels in width, similar to how 2k is slightly wider than Full HD. UHD is considered “broadcast standard” and is essentially 4 times the resolution of Full HD (1920 x 1080 pixels). 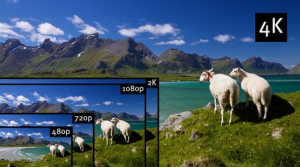 Pixel Density Matters – A key feature of UHD displays is their pixel density. As pixel density increases, so does the clarity of the image—which can be especially important in applications where precise details matter. Calculating pixel density is easy using the formula below: (Width in pixels x Height in pixels) / (Width in inches x Height in inches) = Pixel per inch (PPI). Adoption of 4K is Accelerating – There is increased demand for 4K technology in resolution-rich commercial applications where detailed information needs to be displayed with tremendous precision. This is especially true for command and control centers, digital signage/video walls, interactive displays (like touch-screen exhibits), 3D experiences, graphic design purposes and even corporate desktop users. Ecosystem for Commercial 4K is Evolving – The 4K ecosystem can be summarized as Capture – Play – Connect – Display, and all four pieces have to be there to create a useful solution. First, users need to capture content via a 4K smartphone camera, production camera/camcorder or video source. Next, the content is encoded using High Efficiency Video Coding (HEVC), or H.265, which doubles the compression ratio compared to H.264. So, video is encoded at the lowest possible bit rate without degradation in video quality. Newer model MacBook Pro’s or Mac Pro’s support 4K, but users other PCs may need updates to their graphics card to support the new technology. Trinity Video Communications provides state-of-the-art audiovisual and video communications solutions to large corporations and healthcare organizations to transform the way they communicate and collaborate. Trinity Video also provides real-time unified communications to government agencies including the Department of Justice, Department of Defense, and law enforcement agencies at the federal, state and local levels responsible for mission critical initiatives. The company specializes in custom room design and systems integration for executive conference rooms, huddle rooms, classrooms, worship centers, and command and control centers, as well as unified communications, telemedicine solutions, Bring Your Own Device (BYOD) videoconferencing, digital signage, video walls, and streaming video. Trinity Video is headquartered in Louisville, KY, with sales and engineering representatives in Cincinnati, OH, Nashville, TN, Sterling, VA, and Chicago, IL.